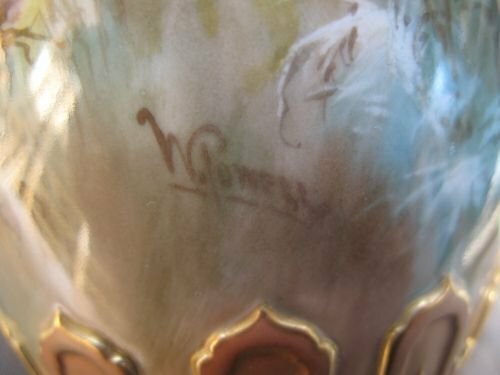 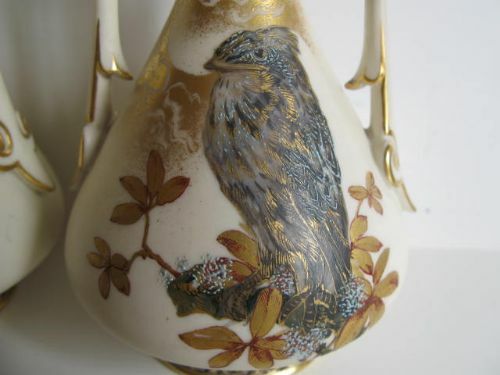 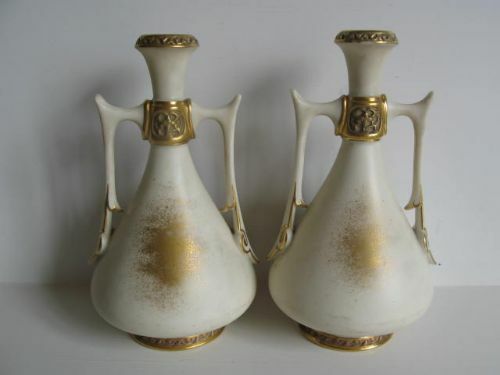 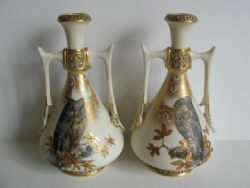 A Pair Of Royal Worcester Two Handled Bird Decorated Vases, Initialled "TR". 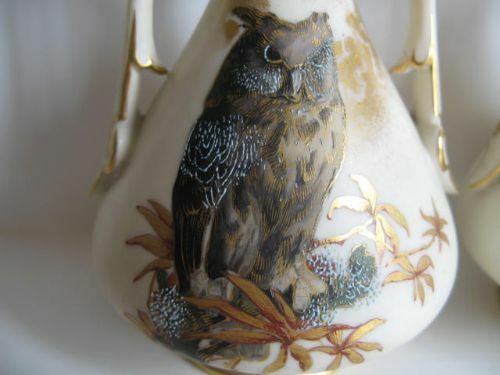 A good pair of Royal Worcester two handled vases, shape number 1021, very well decorated with a perched owl and a jay(? 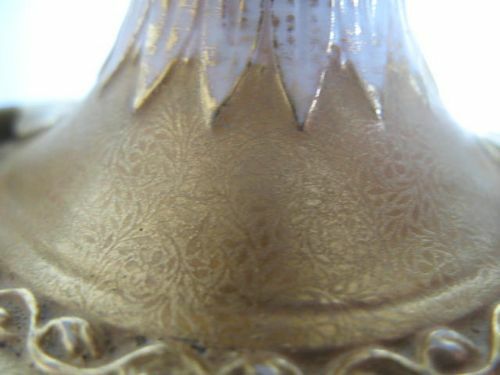 ), the branches and backgrounds with extensive gilding. 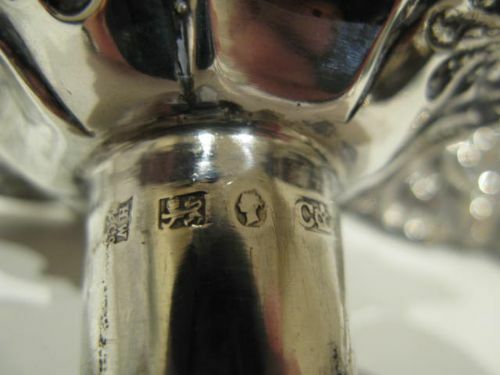 Both bases are initialled in gilt "TR" for foreman gilder George Topham Roberts. Standing approximately 6"high x 3.1/2"diameter, they both have the puce factory stamp for 1887 and are in very good condition with no damage, crazing or restoration, and the gilding is virtually without wear. 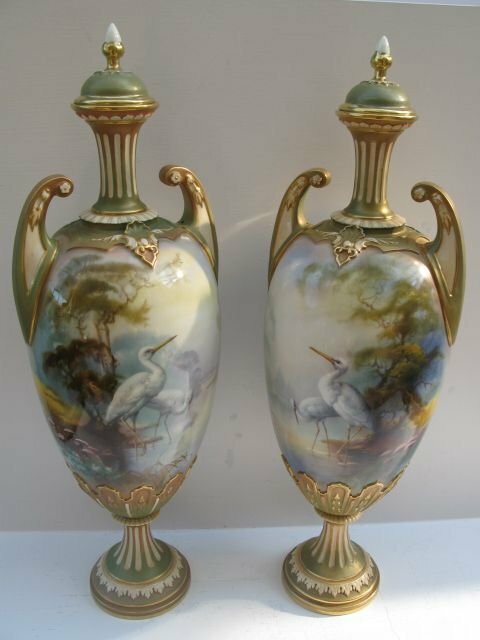 A Pair Of Royal Worcester Vases With Wading Stork Decoration By Walter Powell. 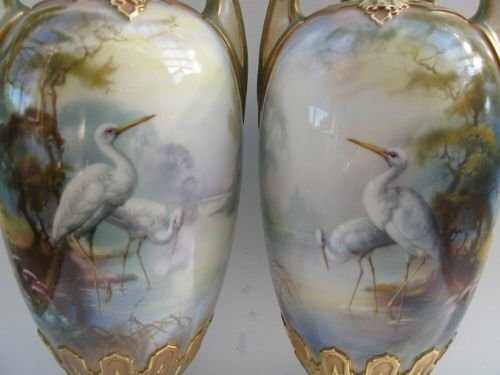 A fabulous pair of Royal Worcester porcelain vases, shape number H179, with very well painted all around decoration of wading storks in a wooded riverside setting by the specialist artist, Walter Powell. 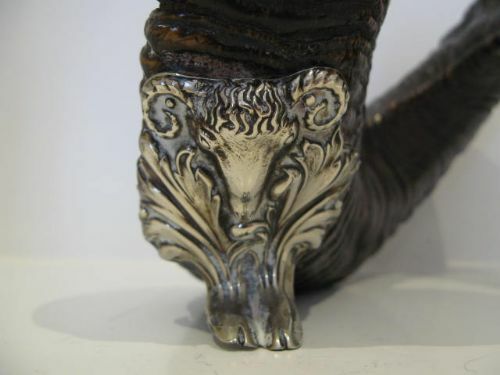 Standing approximately 16.1/2"overall height x 5.1/2"wide over the handles, and with the dark green factory stamp for 1903, they are in excellent condition with no damage, crazing or restoration, and the gilding shows virtually no sign of wear. 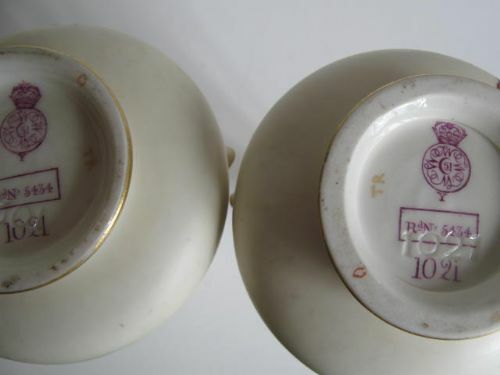 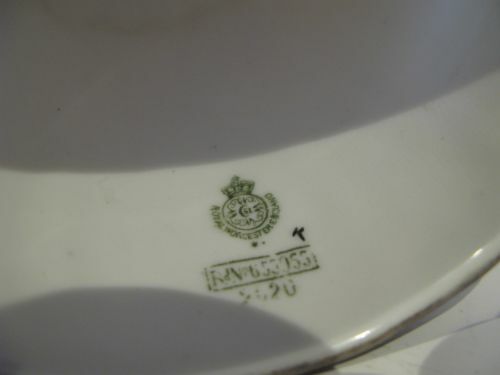 The matched porcelain lids are almost exact copies of the Royal Worcester originals, and finish the vases beautifully. 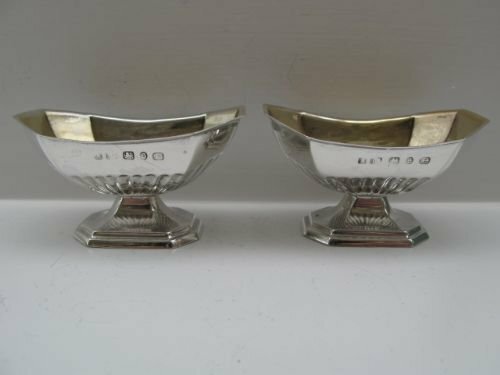 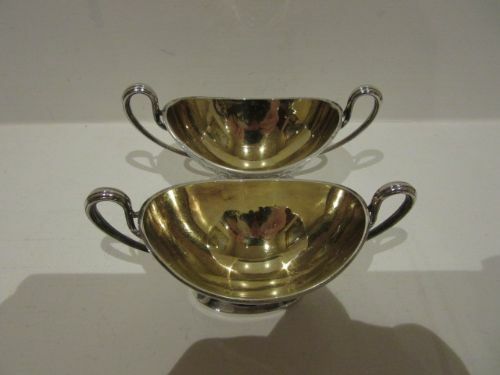 A Pair Of Silver Bon-Bon Dishes, Birmingham 1912. 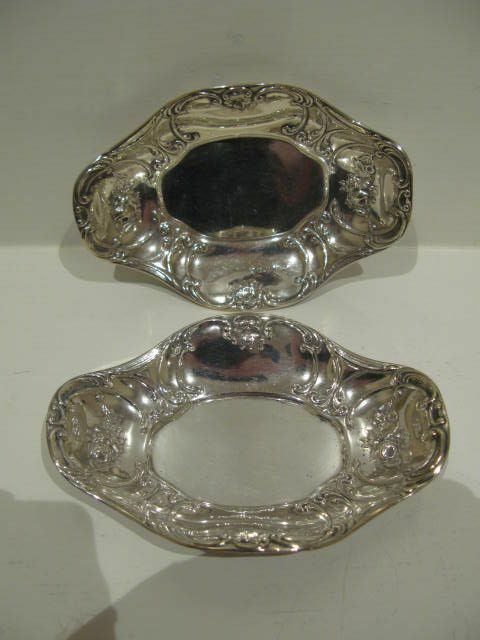 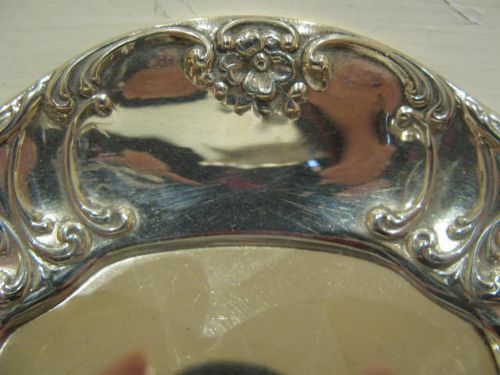 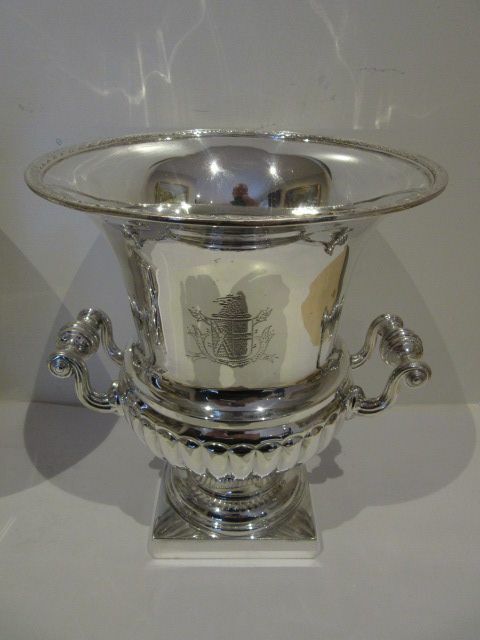 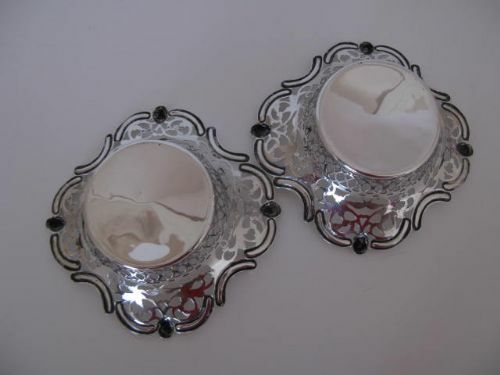 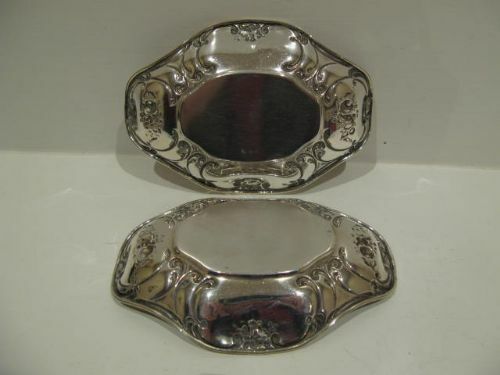 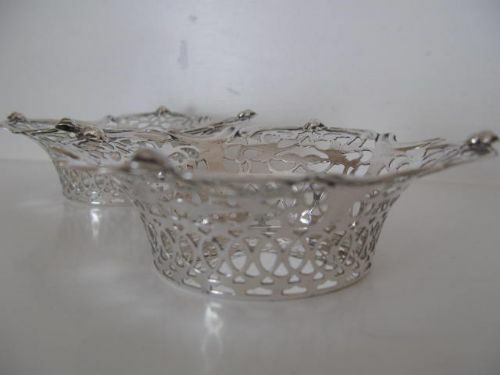 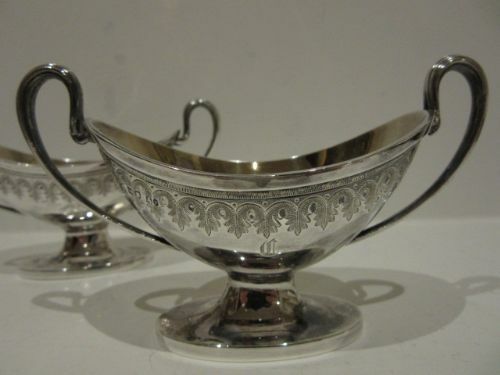 A useful pair of solid silver bon-bon dishes, with attractive "C" scroll and flower embossed decoration. 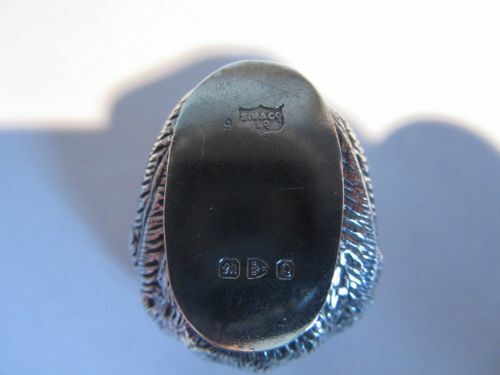 Standing approximately 5.1/4"long x 3.5/8"wide x 7/8" deep and with well struck, clear hallmarks for Birmingham 1912 by G.M Co, they are in very good condition with no damage, repairs or dinks. 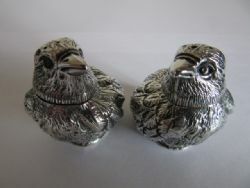 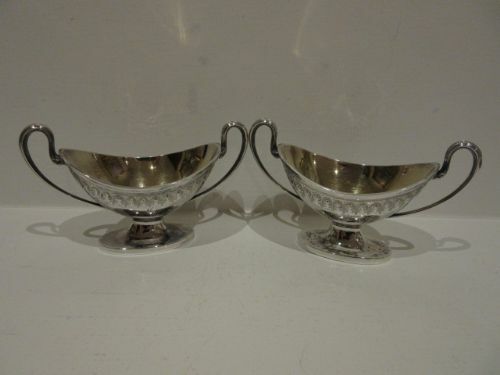 A Pair Of Silver Novelty Salt And Pepper Pots By SAMPSON MORDAN. 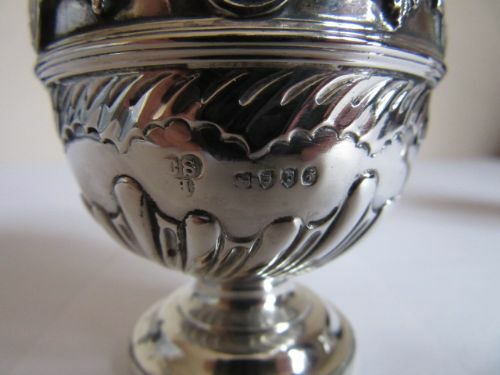 Chester 1899. 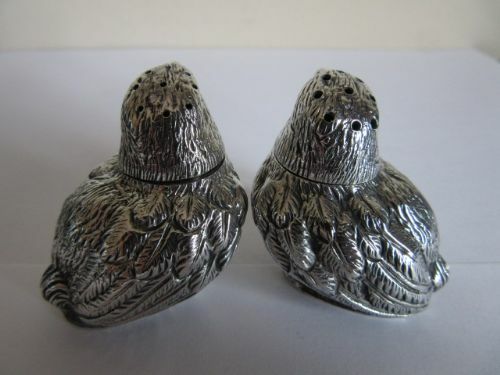 A good pair of Victorian solid silver, novelty salt and pepper pots in the form of chicks, with pull-off heads for filling. Measuring approximately 1.1/2"long x 1.1/4"wide x 1.1/2" tall, they are fully hallmarked to both the heads and bodies for Chester 1899 by the highly regarded Sampson Mordan Company, and are in excellent condition with very well detailed plumage and no damage, dents or solder repairs. 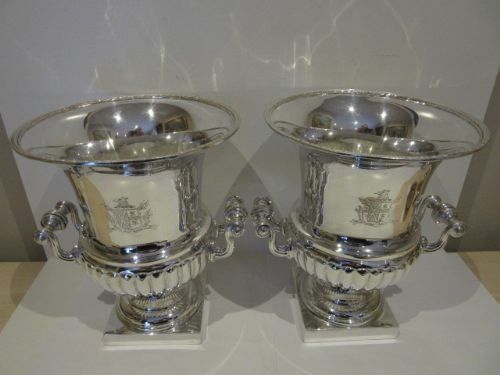 A Pair Of Silver Plated Armorial Wine Coolers. 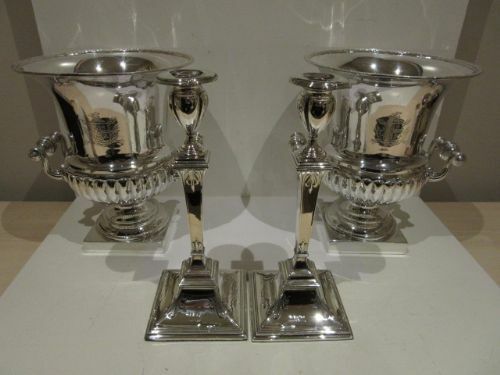 A handsome and impressive pair of campana shape silver plated wine coolers with twin handles and armorial crests, all raised on pedestal feet. 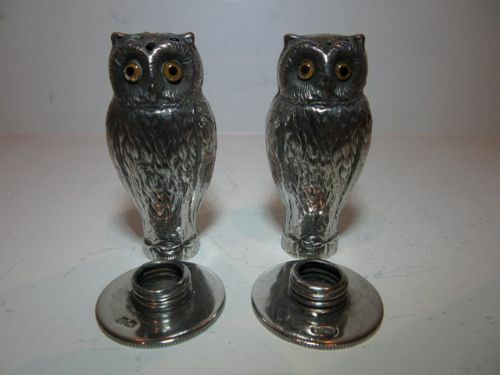 Standing approximately 10" tall x 9"wide over the handles and dating from the first half of the 20th century, they are in excellent condition with no damage, dents or solder repairs. 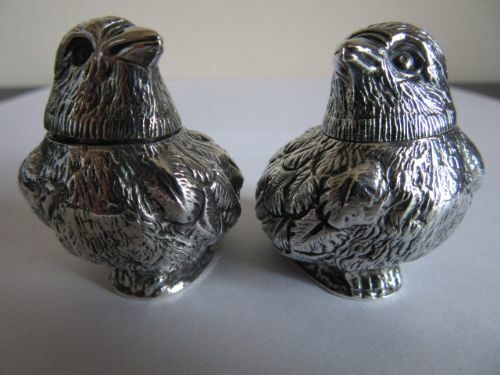 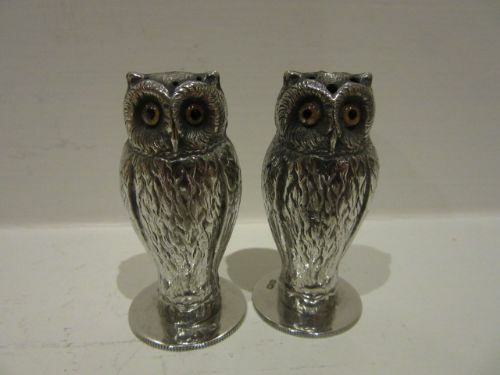 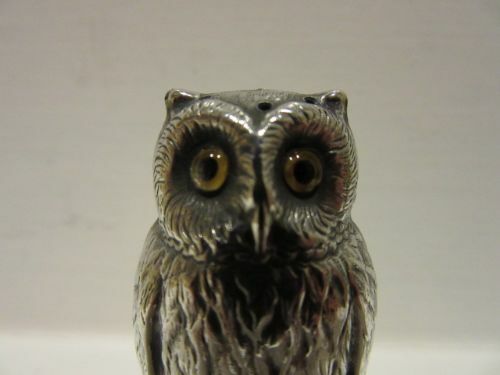 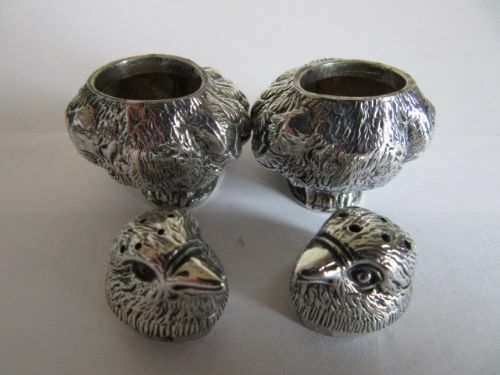 A Pair Of Silver Salt And Pepper Pots In The Form Of Owls. 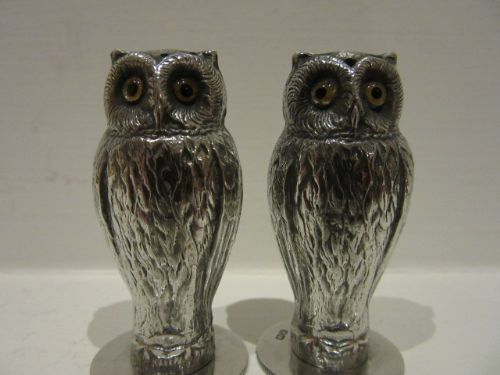 A good pair of solid silver salt and pepper pots in the form of owls with well detailed bodies, glass eyes and screw-off bases for filling. 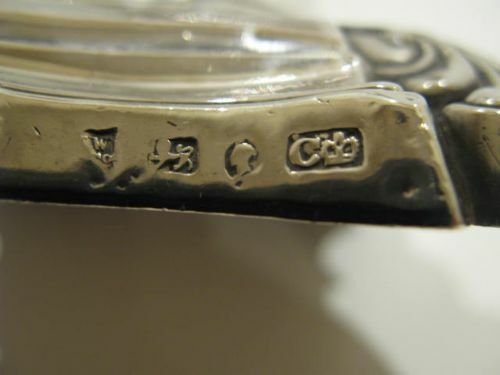 Measuring approximately 2"tall x 1"wide at the bases, they have full hallmarks to the bodies for Chester 1912 by J. C. Vickery with corresponding partial hallmarks to the screw-off bases, and are in very good condition with no damage, dents or solder repairs. 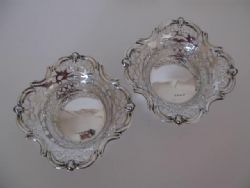 An attractive pair of Edwardian silver bon-bon dishes, with pierced sides, scalloped wavy edge and cherub head decoration. 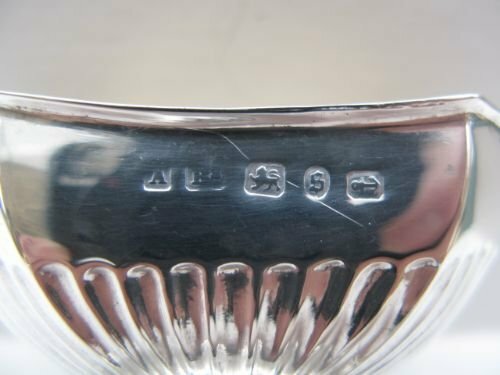 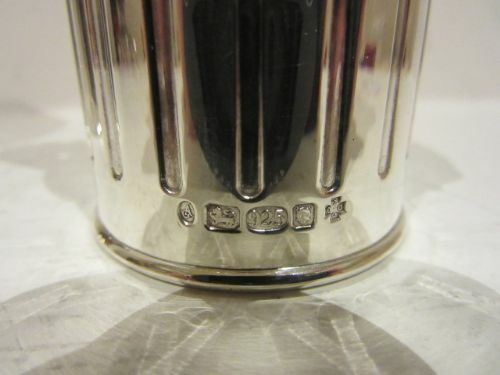 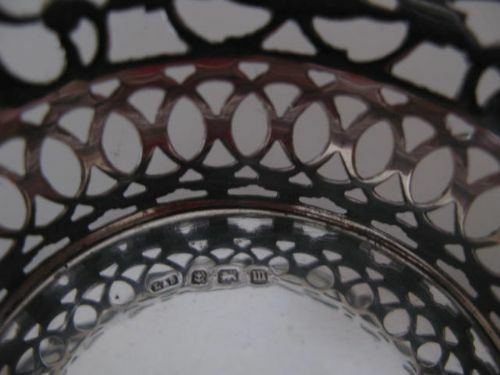 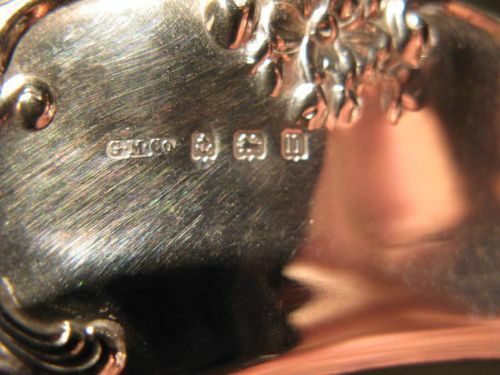 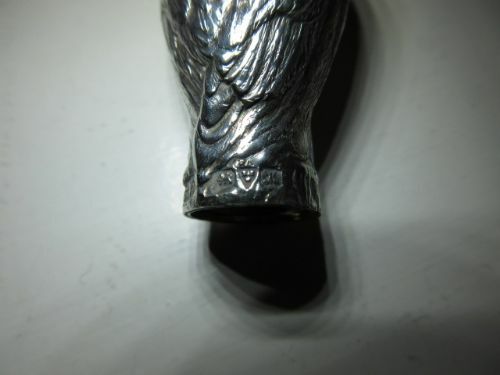 Hallmarked for Birmingham 1911 by Levi and Salomen, they measure approximately 5.1/2"wide x 1.3/4" high, weigh 4.1/4 troy ounces and are in good condition with no damage or repairs and only one very slight ding to the base of one of the bowls. 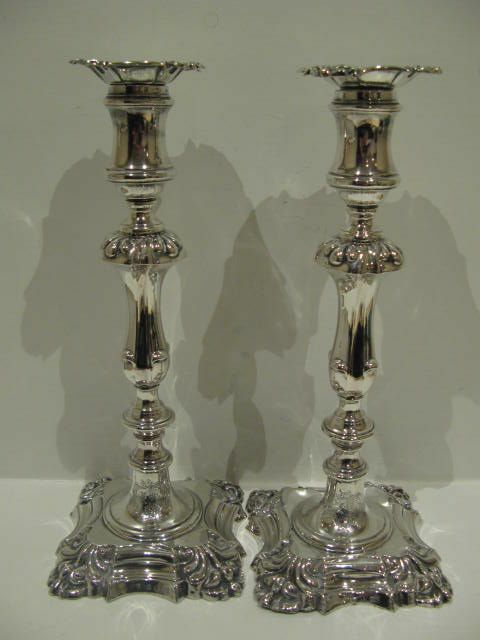 A Pair Of Victorian Double Crested Silver Candlesticks, Sheffield 1846. 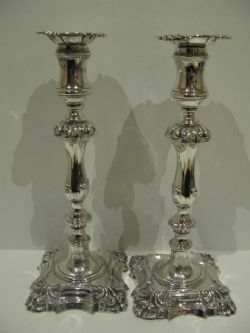 A handsome pair of early Victorian loaded silver candlesticks in Georgian four shell style, and of good size and proportions standing approximately 11" tall on 4.1/2" shaped square bases. 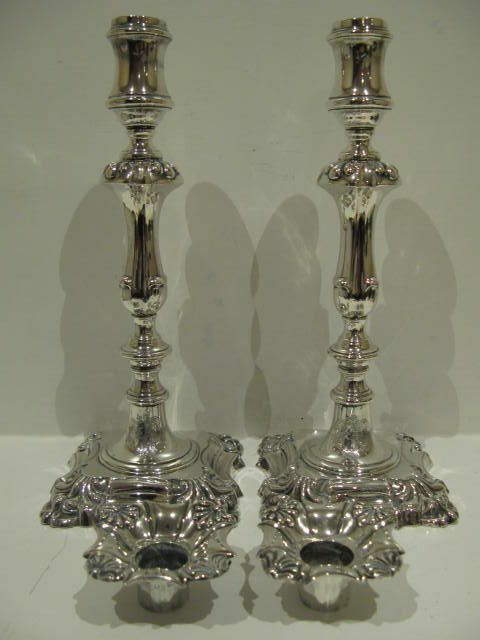 They are fully hallmarked to the bases and the separate sconces for Sheffield 1846 by Henry Wilkinson & Co. and are in very good condition with no damage or repair and only a few pin-head size dinks as witness to their 167 years of age. 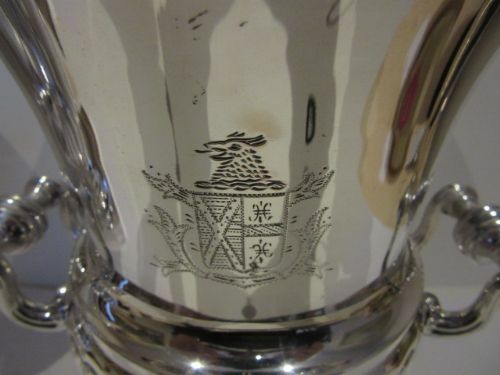 Interestingly, they have two family crests to each candlestick, which was usually a sign of them being given to commemorate the coming together/marriage between members of two wealthy or important families. 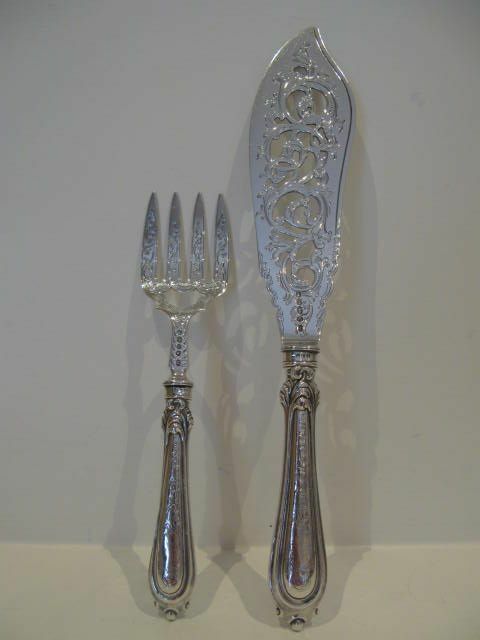 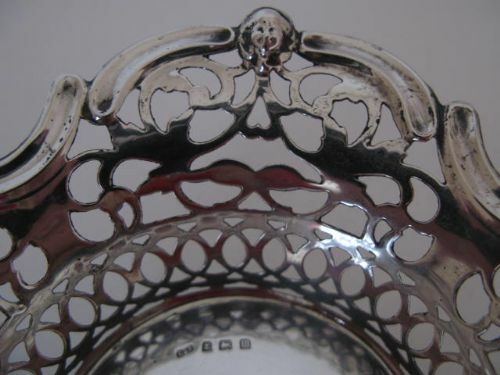 A Pair Of Victorian Silver Fish Servers, Birmingham 1859/60 By John Gilbert. 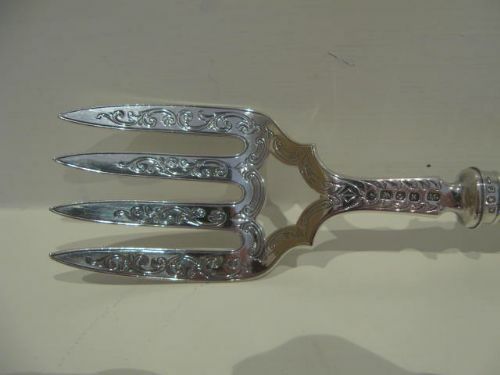 A good pair of substantial quality, Victorian solid silver bladed fish servers, with hallmarked loaded silver handles and very attractively pierced and engraved decoration. 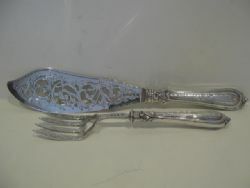 The knife measures approximately 13.1/4"long x 2.3/8"wide, the fork 9.1/4"long x 2"wide, and both have clear and well struck hallmarks for Birmingham 1859/60 by John Gilbert. 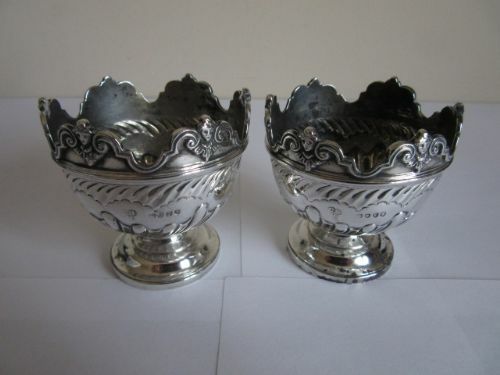 The handles are firm and without movement, and apart from a few dings and light rubbing to the engraved handles, the pair are in lovely condition with no damage or repair. A Pair Of Victorian Silver Miniature Monteith Bowls, London 1881. 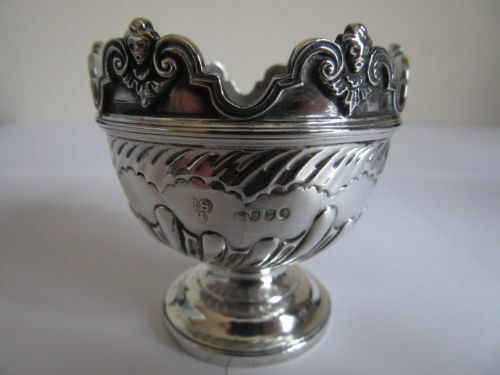 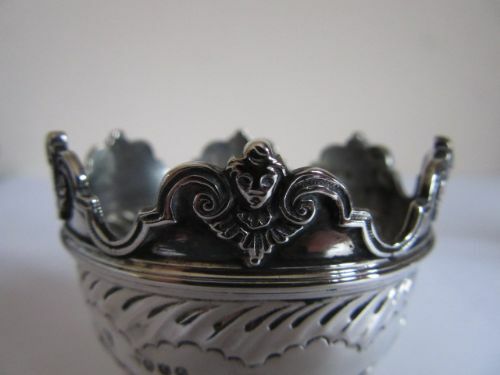 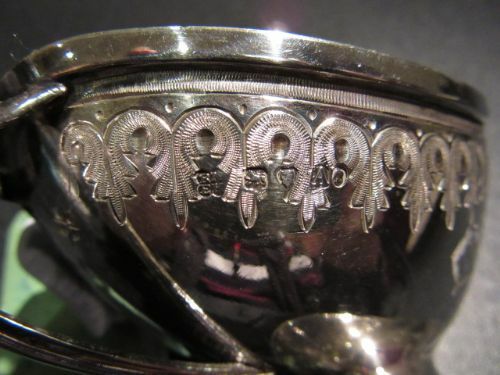 An attractive pair of Victorian solid silver miniature bowls in the style of Monteith, with applied cast undulating rims and cherub head decoration. 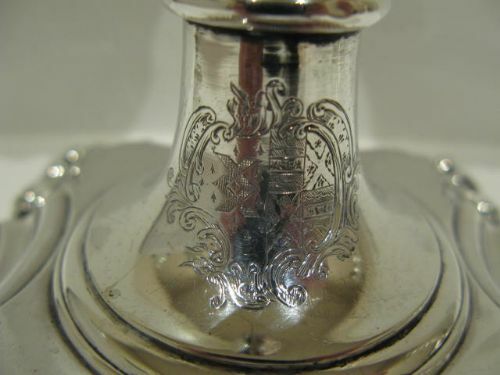 Measuring approximately 2.1/4"diameter x 2.1/4"tall, they are hallmarked for London 1881 by Charles Stuart Harris and are in good condition with no damage, dents or solder repairs. 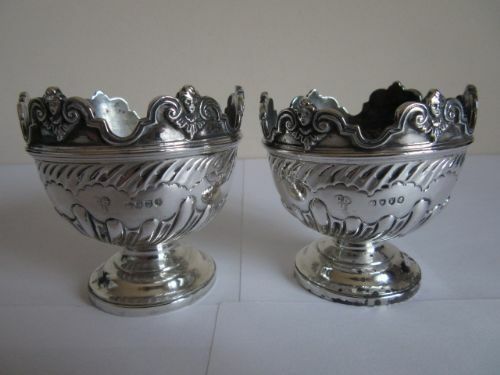 A Pair Of Victorian Silver Salts, Birmingham 1892. 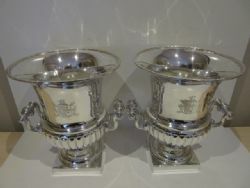 A pair of Victorian solid silver pedestal salts with eight-sided, half fluted and gilt bowls. 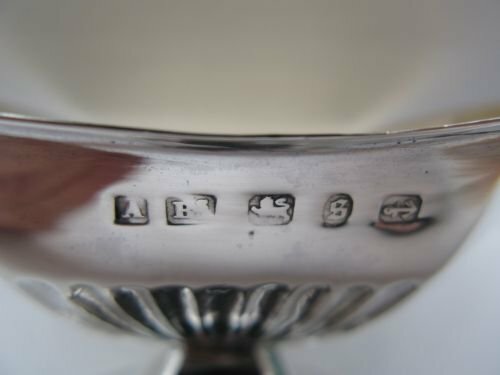 Measuring approximately 2.3/4"long x 1.3/4"wide x 1.1/2"tall and weighing 33gms each, they are hallmarked for Birmingham 1892 by Ahronsberg Bros. Apart from the slight rubbing to the hallmarks and one or two tiny pinprick-size dinks, they are in very good condition with no damage or repairs. A Pair Of Victorian Silver Salts, London 1876. 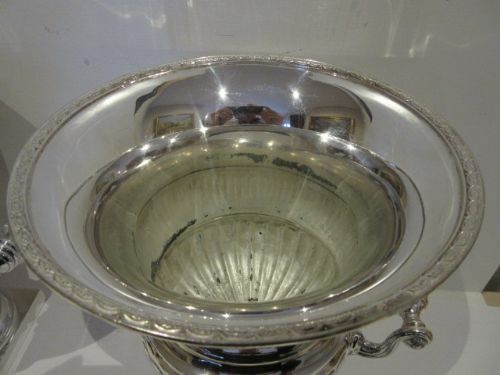 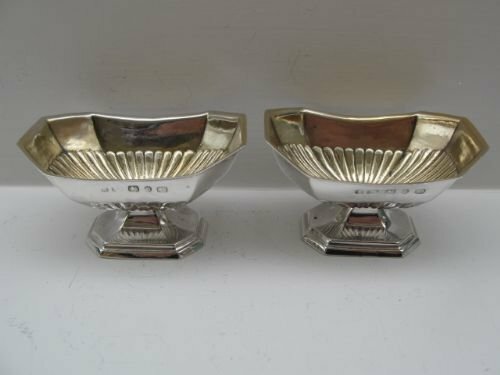 An attractive pair of Victorian solid silver open salts of elegant navette shape on pedestal foot, with gilt interiors. 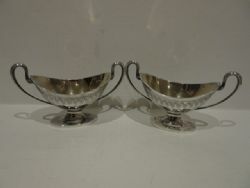 Measuring approximately 4.3/4"wide over the handles x 2.1/4"deep x 2.3/4"tall, they are fully hallmarked for London 1876 by the well regarded Martin Hall Co. and are in very good condition with no damage, dents or solder repairs and the gilding to the interiors is a good mellow colour. 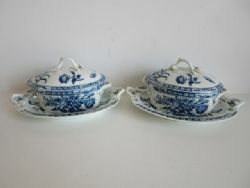 A Pair Of Worcester Lidded Tureens And Stands Circa 1770. 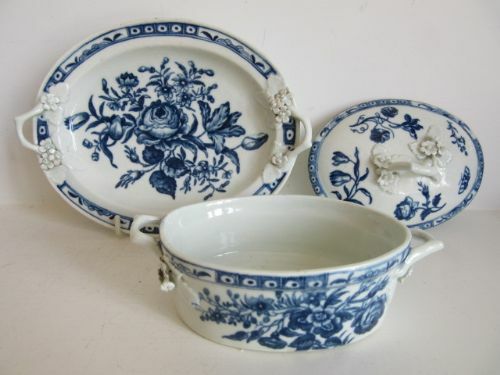 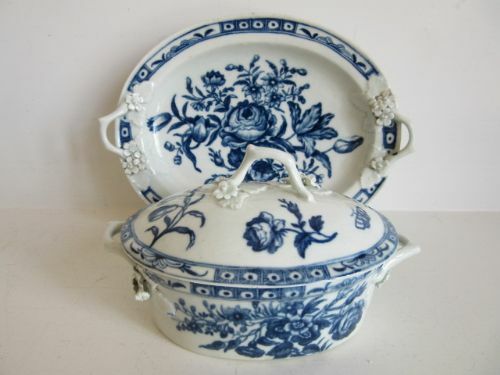 A very attractive small pair of Worcester oval form lidded tureens on stands, decorated in underglaze blue and white with a mixture of "The Three Flowers" and "The Rose-Centred Spray" decoration. 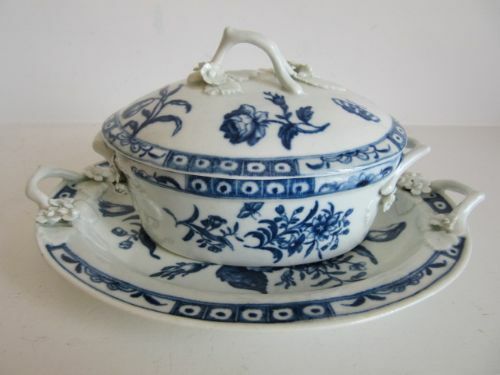 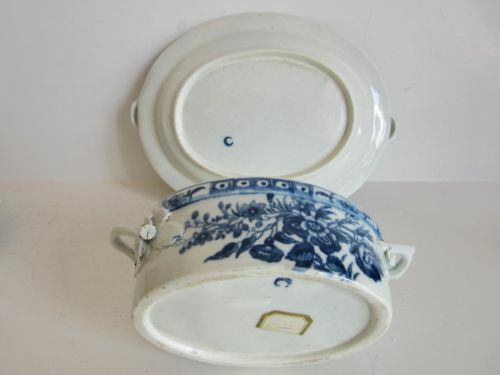 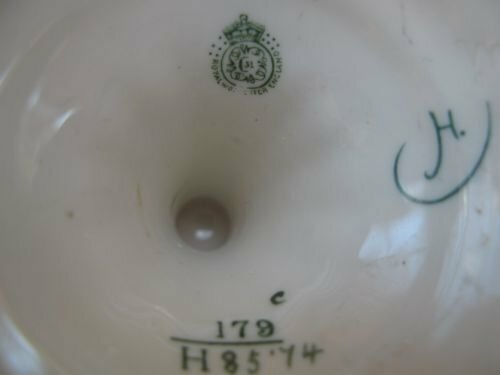 The underplates measure approximately 7"long x 5.1/4"wide x 1"deep and the tureens with their lids measure 5.1/4"long x 3.1/2"wide x 3"overall height, with the underplates and the tureen bodies having the factory hatched crescent mark. 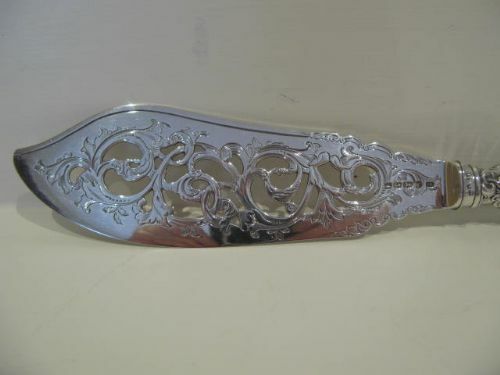 Other than the usual small losses from a few of the petal tips, they are all in excellent condition with no damage, chips, hairlines, crazing or restoration. 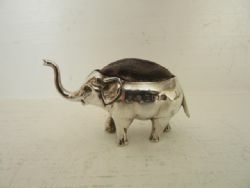 A Quite Rare Silver Elephant With Raised Trunk Pin Cushion, Birmingham 1904. 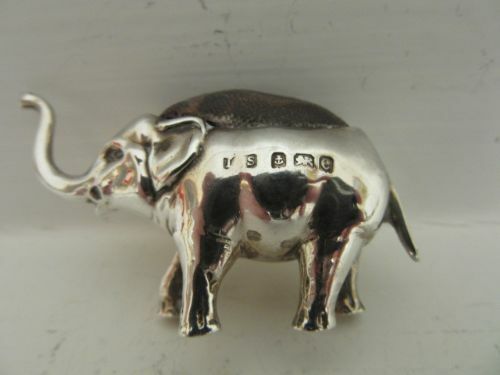 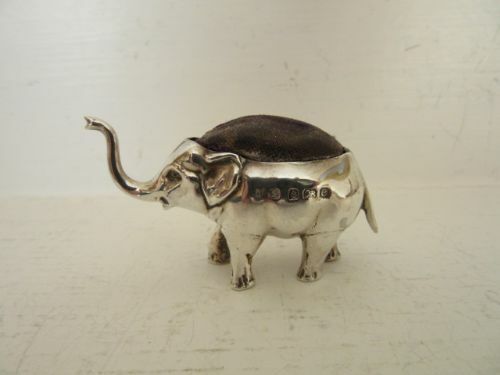 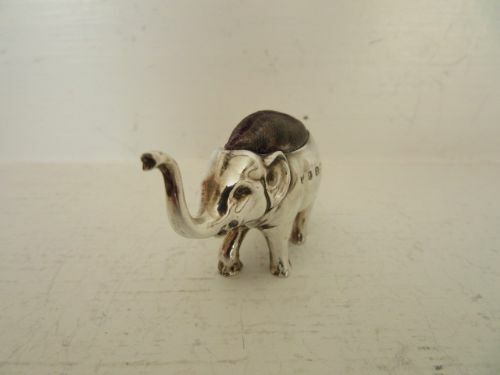 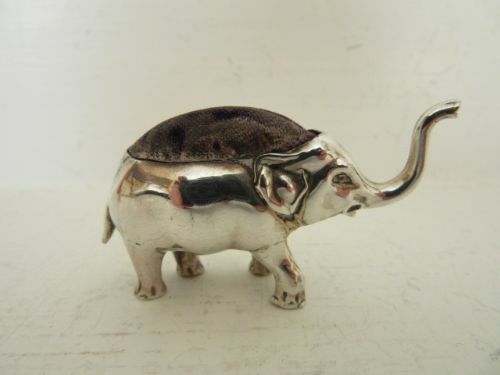 A good and quite rare Edwardian silver pin cushion in the form of an elephant with its trunk raised, as opposed to the much more readily available examples with lowered trunks, by the specialist makers Levi and Salaman. Measuring approximately 2"overall length x 1.1/8"tall and retaining its original cushion, it has clear hallmarks for Birmingham 1904 and is in very good condition with no dents or damage and would enhance any silver pin cushion collection. 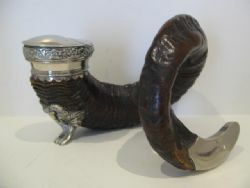 A Rams Horn Table Snuff Mull. 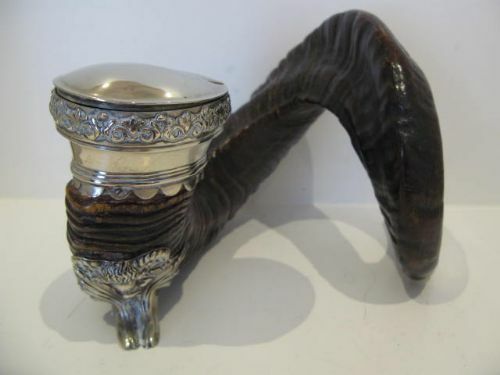 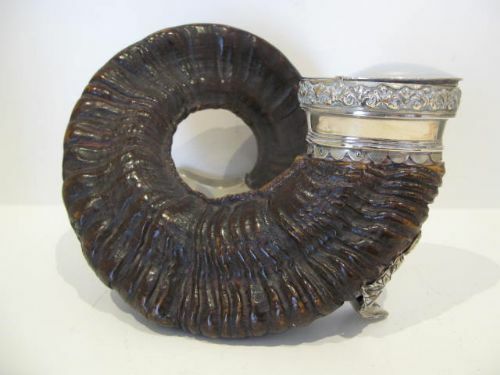 A handsome and substantial, late 19th or early 20th century silver plate mounted rams horn snuff mull, the horn of good colour and patination. 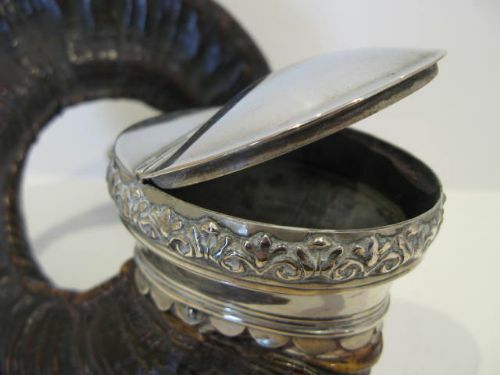 Dating to circa 1890-1920, it stands approximately 9.3/4"long x 7"high x 8"wide and is in very good condition with no damage or repairs. 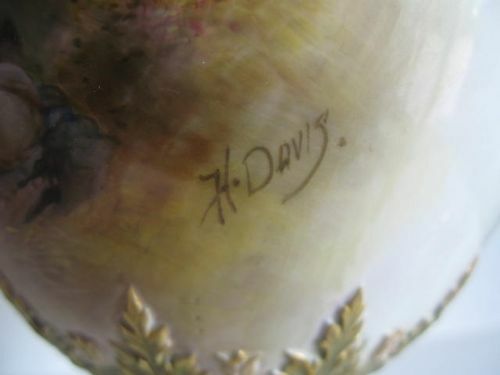 A Rare And Substantial Royal Worcester Sheep Painted Vase By H. Davis. 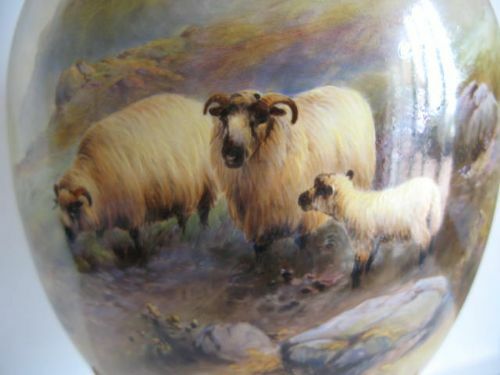 A very impressive Royal Worcester porcelain lidded vase shape number H111, which is listed as "rare" in "James Hadley and Sons" by Peter Woodger, with a finely painted scene of two black-faced sheep and their lamb in a mountainous Scottish setting by Harry Davis. 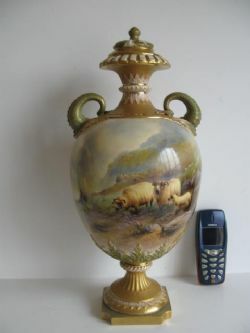 Apart from the lovely painting of the sheep, to give a better idea of the overall quality of the vase, the handles are formed as well detailed Lampreys and the gilded areas of the neck and the foot are actually comprised of a matt gilt finish and a bright gilt finish, forming a floral patterned overall effect. 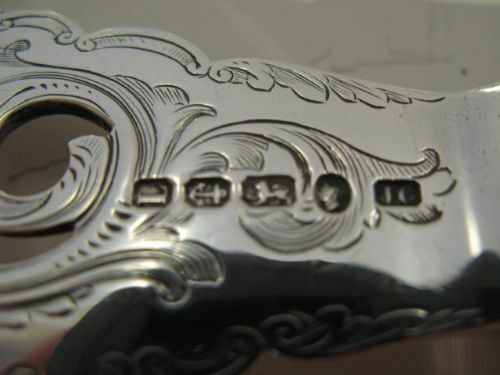 Truly an excellent exhibition of the skill of the gilder. 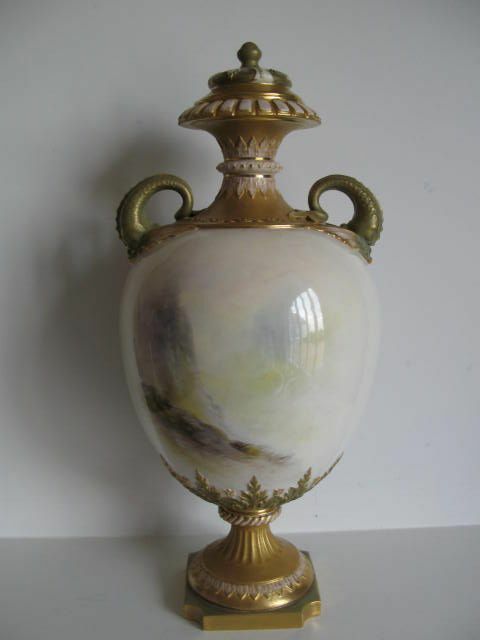 It stands approximately 14.1/2"overall height x 6.1/2"diameter with the dark green factory stamp for 1908, and is in very good condition with no damage, crazing or restoration, and the gilding is in good condition apart from some loss to the area where the lid sits, which is not visible when the lid is in place. 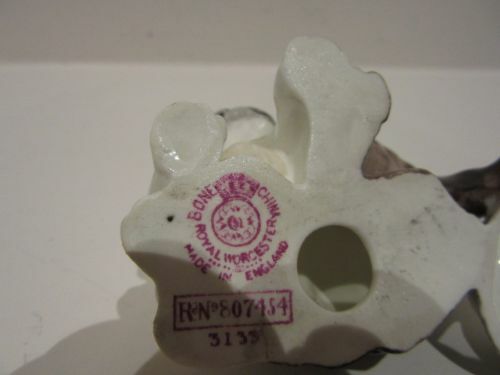 It was stated by the vendor that the finial of the lid was knocked off by them, and they had it professionally re-attached, so please be aware of this, even though nothing shows. 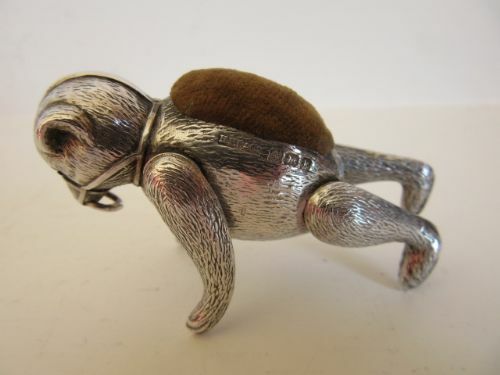 A Rare Edwardian "Bear" Pin Cushion, Birmingham 1909. 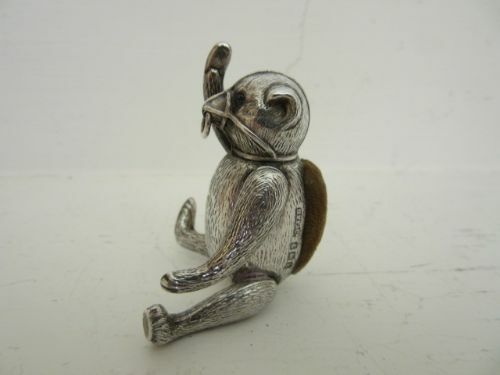 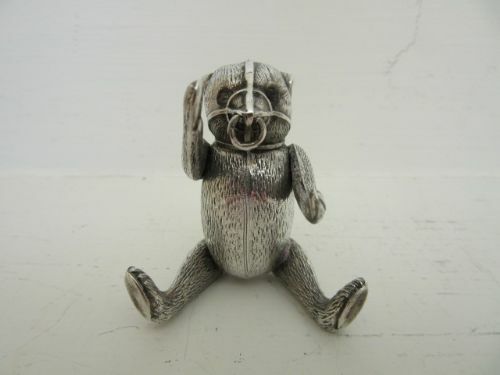 A rare and very appealing Edwardian silver pin cushion in the form of a bear with articulated arms and legs. 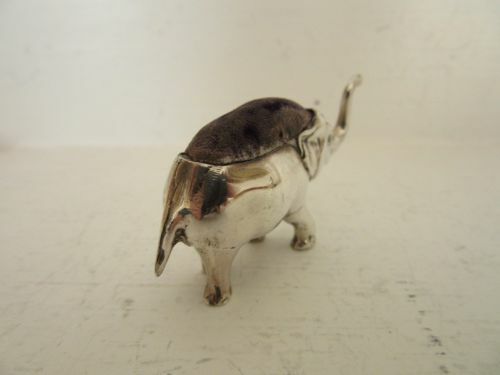 Measuring approximately 2.1/2"tall x 1"wide x 1"deep, it has very well struck and clear hallmarks for Birmingham 1909 by H. V. Pithey & Co and is in lovely condition with no damage, dents, splits or solder repairs and the fur texturing of the body and arms is still clear and well defined. 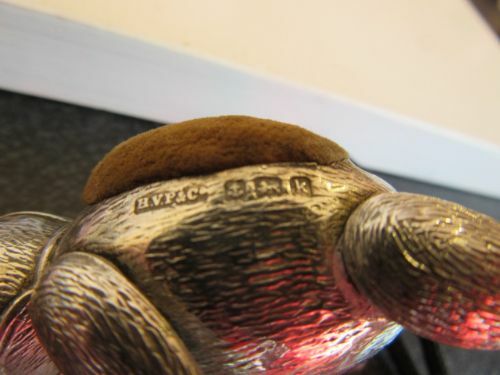 The gold plush of the cushion may be an old replacement, but has certainly been with it for a long time and shows a nice degree of use and wear. 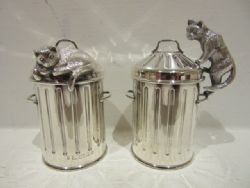 A Rare Pair Of Silver Novelty Salt And Pepper Pots By Aspreys Of London. 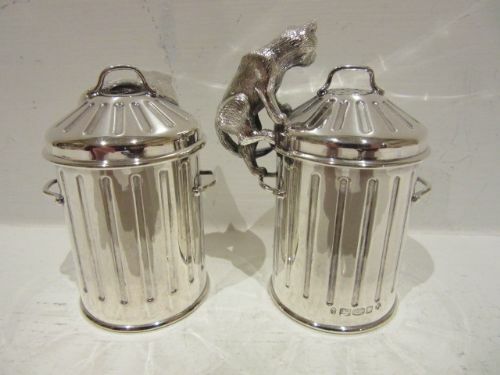 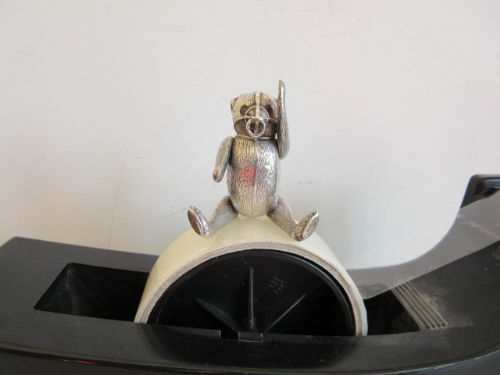 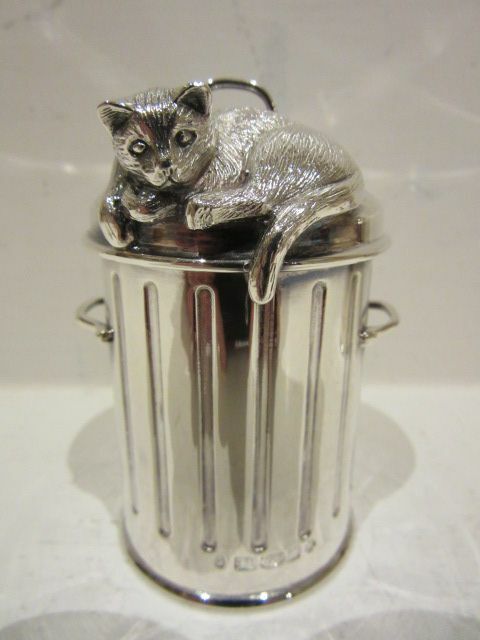 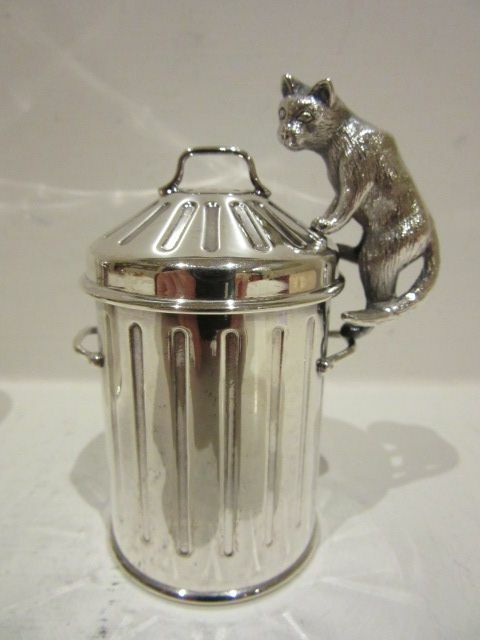 A rare and lovely quality pair of solid silver novelty salt and pepper pots in the form of a pair of scavenging cats on dustbins. They measure approximately 2.3/4" and 3.1/4"overall height and have the full Millenium hallmarks for London 2000 by Aspreys of London. 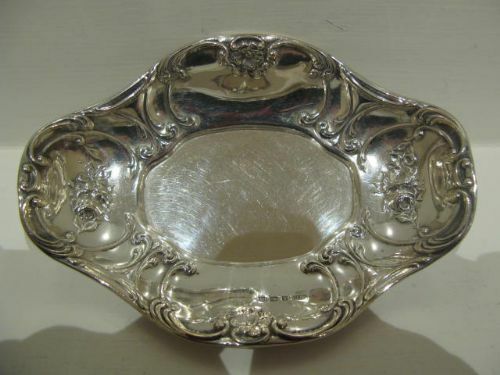 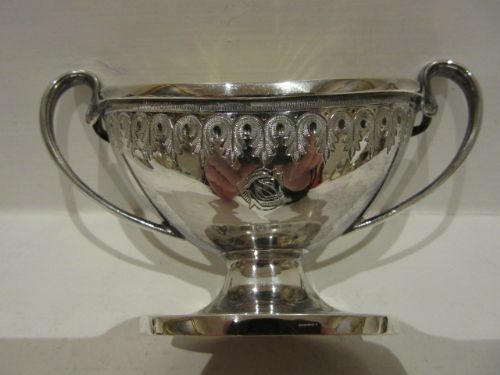 As is to be expected from Aspreys, the quality of their manufacture is superb feeling substantial and solid in the hand; this and their rarity will ensure that they are always keenly sought after. 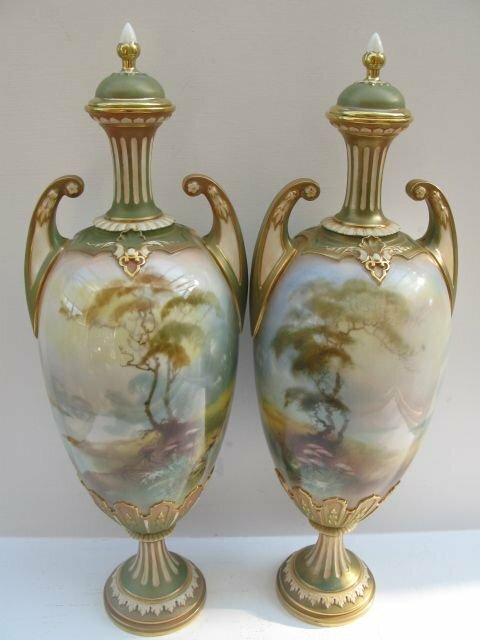 Guaranteed to be admired!! 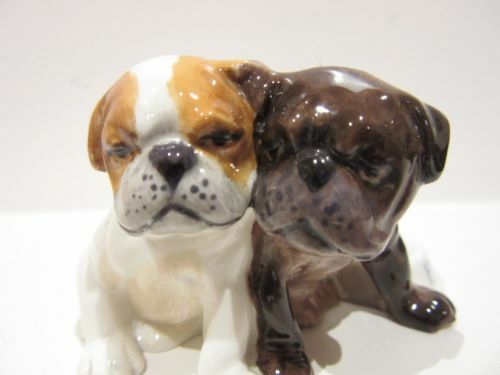 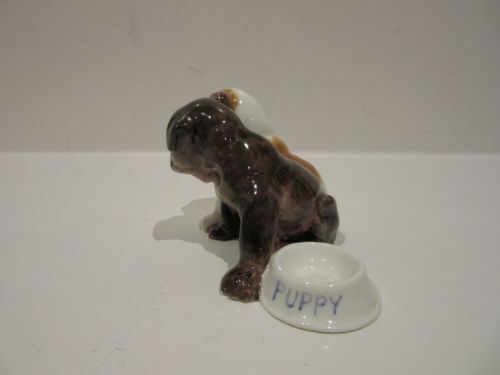 A Rare Royal Worcester Figurine Of Bulldog Puppies. 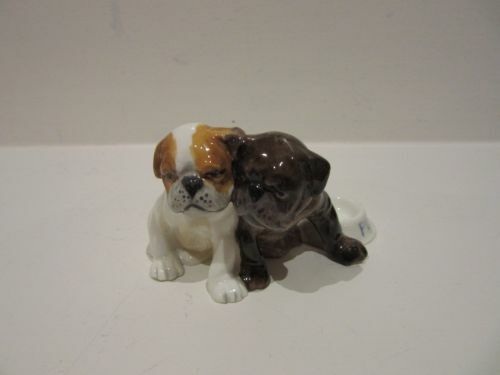 A fine Royal Worcester porcelain figurine of a pair of bulldog puppies modelled by Doris Lindner, shape number 3133 which is listed in Sandons reference book as "extremely rare". 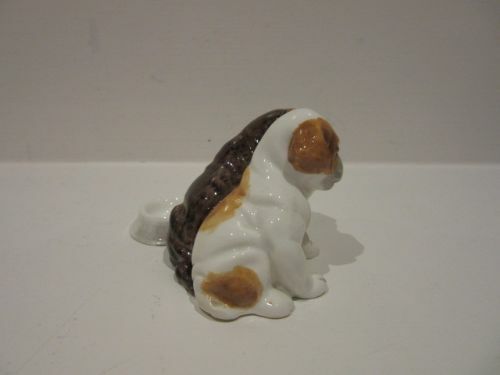 Measuring approximately 3.1/4"wide x 2"deep x 1.3/4"tall, it has the puce factory stamp for 1941 and is in excellent condition with no damage, crazing, scratches or restoration. 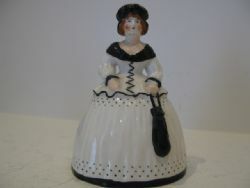 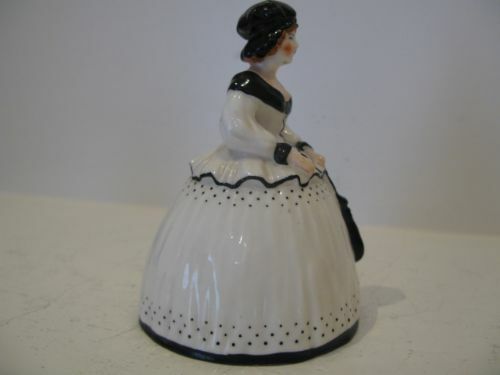 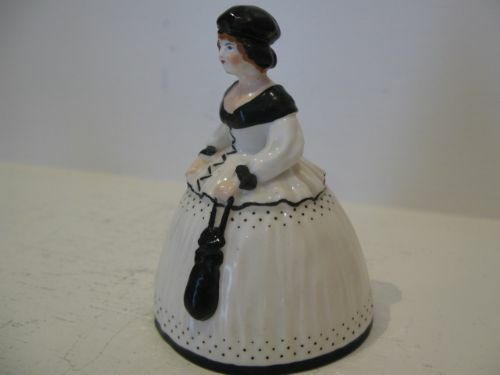 A Rare Royal Worcester Figurine, "Crinoline Lady With Cap" Dated 1917. A well modelled, early Royal Worcester porcelain figurine, shape number 2620 titled "Crinoline Lady With Cap", first produced in 1916 and listed in Henry Sandons Royal Worcester Porcelain as "rare". 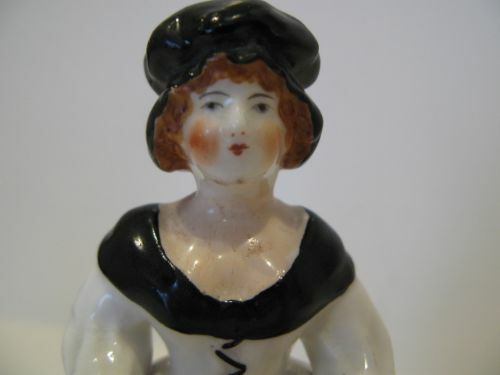 Standing approximately 4.3/4"tall x 3.1/2"wide, it has the dark green factory stamp for 1917 and is in very good condition with no damage, crazing or restoration.